Northern Dalmatia is known as the seaside tourist region in Croatia, situated between the Kvarner region and Central Dalmatia. It starts in the vicinity of the island of Pag and ends in the vicinity of the picturesque town of Primošten. This is a great place to relax and starting point for visiting the national parks Plitvice, Paklenica and Kornati. Nearby is the Krka National Park, famous for its waterfalls. Very interesting terrain will entertain both beach-goers and people who like to climb. North Dalmatia is particularly attractive for the sake of a unique coast, very clean sea, nice beaches, beautiful cities and the archipelago of over 1,200 islands. On the coast line you will find numerous bays, peninsulas and islands and steep cliffs. This region is full of charming, quiet and intimate fishing villages and lively resorts. The main towns of North Dalmatia are Starigrad-Poklenica, Privlaka, Nin, Zadar, Biograd na Moru, Vodice and Sibenik. In the area of Northern Dalmatia is a very large lake Vrana. The North Dalmatia has a Mediterranean climate. Hills are covered with olive trees, fig trees and pine forests. In the summer the maximum temperature is about 30 degrees. However, in winter the temperature rarely drops below 0. In Northern Dalmatia you will find beautiful beaches; gravel and rocky. In this region you will also find several beaches for naturists. Worth a visit is the city of Zadar. Between the historic city walls and gates we find a lot of interesting places, many cafes and restaurants, several churches and museums. Worth seeing is a Pre-Romanesque church. Donata from ninth century the Romanesque cathedral of St. Anastasia from the turn of the twelfth and thirteenth centuries. Very valuable and famous monument is located in Sibenik Cathedral. Jakublocated on the UNESCO World Heritage List. 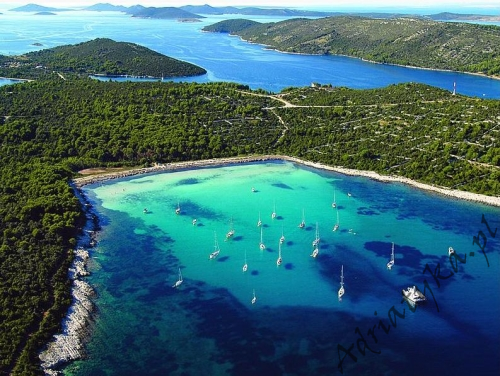 An unusual attraction in Northern Dalmatia is the Kornati National Park. It is a paradise for divers. Park has about 140 islands, most of them are uninhabited and barren, but they create ideal conditions for sailing and swimming.